EDITOR’S NOTE: This story appears in the August issue of Women’s Pro Rodeo News, the official publication of the WPRA. It is re-published here with the WPRA’s approval. Like a lot of circuit cowgirls, Fonda Galbreath has a full-time job, leaving her little time to compete in ProRodeo. That means traveling shorter distances in order to compete, which is just fine for Galbreath. She can focus on her primary task, which is pretty important. You see, she also is a veterinarian at Oakes (N.D.) Vet Service, where her husband, Collin, is also a vet. Her work paid off during the WPRA Tour event in Hamel, Minn., from July 10-13, where she and her mount, Frosted Cookies, rounded the cloverleaf pattern in 15.49 seconds, beating runner-up Jaime Newcomer by nearly a quarter of a second. That’s not too shabby for a lady who began competing in barrel racing just four years ago and is running this season on her WPRA permit. Obviously, though, she’s no newcomer to being a horsewoman. She received her undergraduate degree from North Dakota State University, where she met her husband. She continued to ride some while focusing on her studies. Once she graduated from vet school, she began going to cutting competitions with a 4-year-old, Macs Spunkie Mate. “But she wasn’t taking to cutting,” Galbreath said. So she turned to NFR qualifier Jane Melby, who was living in Minnesota at the time. With Melby’s tutelage, Spunkie took to the barrel pattern, and Galbreath’s weekends changed. It looks to be a solid purchase. Lola is a 7-year-old sorrel mare by Cookie Dash out of PC Laughing Sundust, and she’s the reason Galbreath is stepping into the WPRA. “This is my first year in rodeo,” she said. “I bought my WPRA permit Oct. 1 and have entered around 10 rodeos or so. I started out with jackpots, because that’s the level that Spunkie was able to compete at. Knowing the capabilities that Lola has, I decided I wanted to try to compete at the next level. And so does Lola. Her time in Hamel was proof. The future seems quite bright for Galbreath and Lola, an athletic mare with a sensitive nature. “She has the speed and the ability to turn very tight around her barrels, so the combination makes her a likely candidate for being competitive at a higher level,” Galbreath said. “What drew me to the horse is when I watched Molly Otto in May of last year. She clocked very well, and she didn’t look like she was going that fast. She reminded me a lot of Macs Spunkie Mate. What’s next? She’ll remain on her permit until Oct. 1, then purchase her WPRA card and see where the rodeo road takes her. “I’m sitting second in the WPRA Derby standings, so my plan is to finish out Lola’s Derby year and go to the WPRA Finals in Waco (Texas) in the Derby Class,” she said. “I’ll primarily rodeo next season. Whichever is the case, Galbreath certainly is enjoying her run in 2014. She was one of six recent winners on the WPRA Tour, joining Carlee Pierce, who won in Santa Fe, N.M.; Robin Herring, Pecos, Texas; Kassidy Dennison, Window Rock, Ariz.; Megan Swift, Ringgold, Ga.; and Cheyenne Shipps, Clear Lake, S.D. For Shipps, the victory as a mix of great opportunity and better timing for her and VS Easy Dash Home, a 14-year-old sorrel gelding she calls Homie. “I had been doing well and had won the Springfield (Mo.) 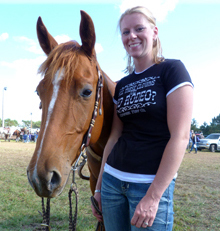 ProRodeo in the spring, but I’d just been placing lately,” said Shipps, 23, of Dadeville, Mo. “I knew my horse was working really well, and I knew Clear Lake was his type of pen. As of mid-July, Shipps was the No. 4 cowgirl in the WPRA rookie race. She purchased her permit in November, then filled it at the WPRA finals. As soon as the championship concluded, she purchased her card for this season. “It means everything to me to be able to compete at this level,” she said. “It’s been my dream to be a professional cowgirl. I made my education my first priority, and I have my master’s degree. This is my first opportunity to ProRodeo. Shipps was raised on a ranch near Dadeville, about 35 miles northwest of Springfield. She earned both her bachelor’s and master’s degrees in Springfield at Missouri State University. She helps her family on their cow-calf operation. She began competing at age 6 and has progressed through the ranks. Now that she has something special in Homie, she knows this is an opportunity to make a run in ProRodeo. “He’s ornery,” she said of the gelding. “He’s a lot of fun, but he tries his heart out every time. He’s a true rodeo horse. He loves the crowds. He loves the excitement and the energy. He handles all kinds of ground. That bond seems to be working now. She hopes it translates into brighter things ahead, from winning the rookie title to eventually competing at the Wrangler National Finals Rodeo.